Battlecry: If you're holding a Dragon, deal 3 damage. He got his name when he gave Blackwing some comic books and rock & roll records. Basically Fire Elemental for the masses. Yep. 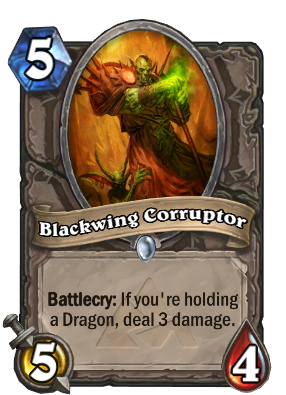 A little more restrictive, but I'm sure decks won't mind running Hungry Dragon and Azure Drake in order to reap this guy's benefits.